You were in California before moving here, right? And that was, what, like 5 years ago? I moved to Michigan from San Francisco summer 2006, after 10 years living in California. What were you doing in California? I was studying documentary filmmaking and worked in the independent film community in San Francisco my last four 4 years at a place called Film Arts Foundation (R.I.P. 2008), which was one of biggest resource centers in the U.S. for independent filmmakers and artists. And what accounts for the attraction to SE Michigan? I also moved from California to be here, and I’m always curious when I come across others who fight against the current like salmon. Yes, I use the salmon analogy often as people seem to question my sanity for moving here from California. I grew up in Detroit and went to UM, so I have a history here and family in Michigan. After graduating I headed West but after a while I missed the (for lack of a better word) “realness” of people and relationships in the Midwest. I also felt that I might paradoxically find more opportunities here to be creative and entrepreneurial, which has proven to be the case. 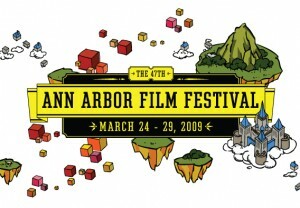 What’s your vision for the Ann Arbor Film Festival? 25 years from now, what would you like for people to say about your tenure as director? My vision for the Ann Arbor Film Festival is one of creative engagement, where during film festival week the city becomes an intersection of the world’s most passionate, talented and visionary filmmakers colliding with cinema enthusiasts, art world academics, new media makers and our wonderfully welcoming local community. As the original independent film festival in America, with a worldwide reputation for showing bold, high-caliber and artfully-crafted films, I believe we have all the ingredients to become a bigger destination festival for people who love the art of film or seek creative inspiration. In 25 years I would like for people to say that my tenure as director provided the festival with a major step toward fulfilling its full creative potential on both a local and international level. I also would like to hear that during my tenure the festival greatly increased the engagement, sense of ownership and pride of its regional community. Why has Sundance prospered like it has? Is it all thanks to the efforts of Robert Redford, or is there something else about it? And would you consider that festival successful? Or, is it too focused on distribution deals and the business of Hollywood? I believe that Sundance benefited from the star power of Robert Redford, but grew dramatically because he created a vision and model that worked. I would consider their festival very successful in terms of supporting independent filmmakers, helping to launch careers and making a major impact into the way films are distributed. Along with that, it’s also become dominated by a celebrity scene and industry-driven culture that I believe is at odds with the spirit and vision of the festival. I personally believe it’s still a vital festival for independent filmmakers, but it’s not one of my favorites in terms of the experience and atmosphere it creates. You mention the Sundance model… What exactly do you mean by that? It’s not a specific model. I’d say that it’s more like he came up with a good recipe of ingredients that worked — ie, proximity to LA, ski town, enough star power to get it rolling, strong vision & commitment, etc. What do you see as being our niche here in Ann Arbor? I believe our festival, the AAFF, has a great niche and one that will continue to grow as we head toward our 50th anniversary. We’re known for taking great care of our filmmakers and artists, showcasing adventurous, inspiring and high-caliber programs, and creating a welcoming, engaging experience for our audiences. I certainly hope that this year our regional community notices all of our extra efforts to involve local artists, non-profits, and businesses in the creative efforts of our 47th festival. Spring arrives along with the AAFF and we feel it’s time to celebrate creativity in motion. And, speaking of star power, how, if at all, will the festival be changed by the fact that, at least at the moment, we have several features being shot in and around Ann Arbor? I don’t think it will change the festival much, other than increase our area’s interest in film and, hopefully help us build a stronger film culture here. This entry was posted in Art and Culture and tagged Ann Arbor, Ann Arbor Film Festival, Don Hertzfeldt, Donald Harrison, Hollywood, I am so proud of you, independent film, Rejected, Robert Redford, San Francisco, Shadow Art Fair, star power, Sundance. Bookmark the permalink. Post a comment or leave a trackback: Trackback URL. Do you suppose this “brilliant” animator really expected the FLC to accept any one of those pieces? I was all ready to empathize with an artist dealing with unimaginative corporados. But, hell, this stuff was off the point, icky and weird in a bad way. Sorry; I just don’t see the brilliance. Did you watch the whole thing? Did you see all the stuff getting sucked into the black hole. It’s beautiful stuff, Chelsea. I watched the whole thing and it made more sense at the end.